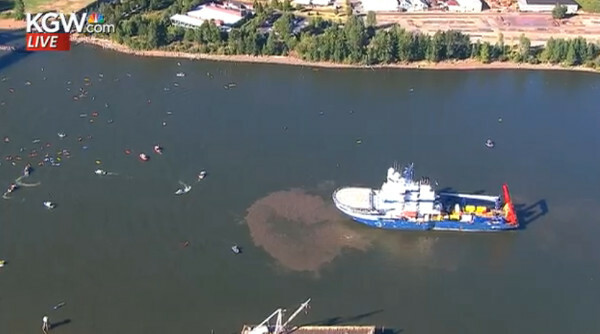 Portland, Oregon: Climate protestors with Greenpeace and Rising Tide have set up a blockade to stop the Finnish ice-breaker Fennica, hired by Shell, to leave port with needed parts for their Arctic oil drilling program in the Chukchi Sea. 13 Greenpeace protestors dangled across the river below the St John's bridge with linked lines to prevent passage of the ship. They were supported by a crew of 13 on the bridge roadway, a flotilla of kayaktivists, and people gathered in the riverside park. The same day as the Fennica icebreaker was being blockaded in Portland, news was published that Shell is sacking 6500 workers globally due to the downturn in oil prices. Shell joined oil giants BP and Chevron in cutting costs due to a 50 per cent slump in crude prices in the past year. The company's share price rose 4.7 per cent, but the stock has still dropped 17 per cent this year, reported Bloomberg. The protestors setup in the early hours of Wednesday morning before the expected departure of the Fennica, however the ship remained in dock. Another 24 hours passed before the Fennica motored slowly down the Williamette river towards the protestors dangling below the bridge. Authorities stopped traffic going across the St John's bridge and coast guard accompanied the Fennic towards the bridge. Around the Fennica a 500 yard exclusion zone and 100 yard exclusion zone on either side had been declared to stop kyaktavists from disrupting passage of the vessel. 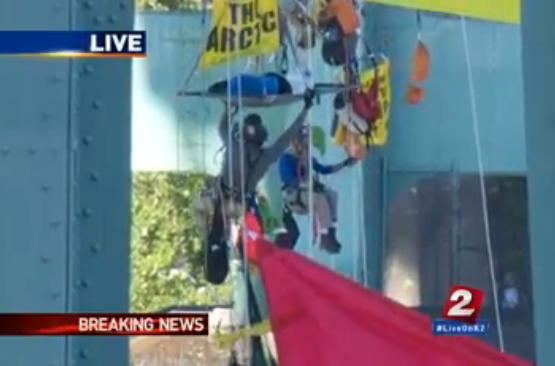 However the dangling activists on the St John's bridge with their linked lines, banners and flags proved too much. 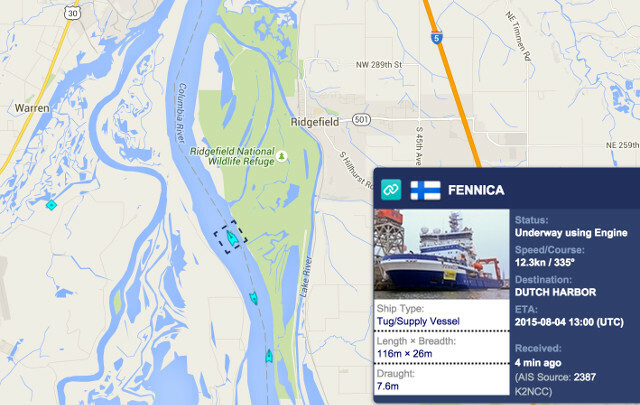 The Fennica slowed then stopped it's approach. After 20 minutes it turned around and remained stationary for a while, before proceeding back to it's dock. At 4pm Thursday police rappelled from above and started cutting the tag lines between protestors. At least two protestor in the middle of the channel was lowered down to a Sherriff's boat below. Greenpeace advised it is up to each protestor to assess the situation with regard to their own safety and decide when to come down. A Second blockade launched on rail bridge upriver, continuing the action against Shell! Jonah locked himself with a bicycle U-lock on the railway bridge. He has now been arrested and removed, but made this statement via Rising Tide on Facebook. Several hundred people are on the banks of the river cheering those in kayaks and the remaining people dangling from the bridge. Sherriff boats are trying to clear a path through the kayaks under the bridge. The permit for Shell to do exploratory drilling ends in September, so every hour and day delaying drilling can make a real difference in Shell's oil exploration. Shell's Arctic drilling program fleet contains two icebreakers. The Fennica sustained damage to its hull and came back to Portland for repairs. It is equipped with a capping stack, which Shell is federally required to have on site in the Chukchi Sea. Until the MSV Fennica and the capping stack are on site in Alaska and Shell is granted federal drilling permits, the company can only drill top wells, thousands of feet above any projected oil, according to Greenpeace. 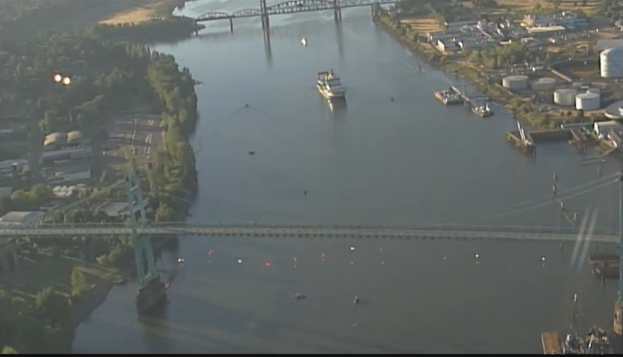 The Fennica passing under the bridge between dangling protestors surrounded by police boats and protest kayaks. Before after passing under the bridge, the ship was blockaded by up to 45 kayaks and canoes, which took coast guard and water police up to 20 minutes to clear a path. The Fennica was even forced to stop and back up a couple of hundred feet at one stage. 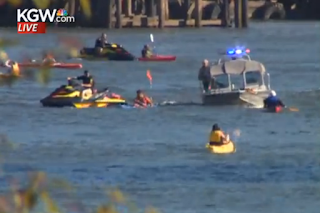 Katu.com described it as Showdown on the water: Video of the battle to keep the Fennica in Portland. Once clear of the protestors, the ship picked up speed, and was shown to be doing 12.3 knots passing through the Ridgefield National Wildlife Refuge, according to bdemelle tracking it's progress. Rose Braz from the Centre for Biological Diversity raised in a tweet "Why is @Shell #Fennica speeding 12.3kt through a Natl Wildlife Refuge? Speed limit? 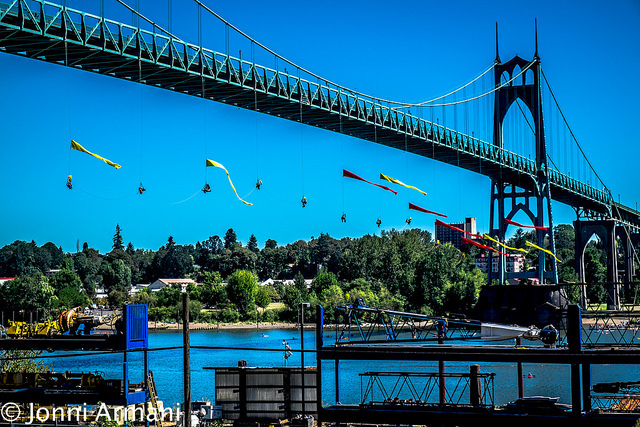 #ShellNo #rules". Indeed. The U.S. Bureau of Ocean Energy Management gave conditional approval to Shell's return to exploration in the Arctic on May 11, 2015. "We have taken a thoughtful approach to carefully considering potential exploration in the Chukchi Sea, recognizing the significant environmental, social and ecological resources in the region and establishing high standards for the protection of this critical ecosystem, our Arctic communities, and the subsistence needs and cultural traditions of Alaska Natives,” said BOEM Director Abigail Ross Hopper in a media release. “As we move forward, any offshore exploratory activities will continue to be subject to rigorous safety standards." A new report entitled “Estimating an Oil Spill Response Gap for the U.S. Arctic Ocean” shows that current oil spill control technologies will only be effective a certain percentage of the time during the summer months — and will be mostly useless during the winter when pack ice covers the drill site. The report, which was funded by the U.S. government, conducts a sophisticated analysis of wind, ice and ocean conditions and concludes that various oil spill control measures will be ineffective anywhere from 18% to 56% of the time during the summer drilling season. Climate scientists have reported in a peer reviewed study in January 2015 that 88 percent of Global Fossil Fuel reserves need to remain unburned if we are to limit global warming temperature rise to 2 °C throughout the twenty-first century. This applies especially to those reserves more marginal and costly to recover such as in the Arctic or under the deep sea. The authors say clearly in the study abstract, "We show that development of resources in the Arctic and any increase in unconventional oil production are incommensurate with efforts to limit average global warming to 2 °C. " I discuss this study in particular with regards to development of Galilee basin coal in Queensland, Australia. 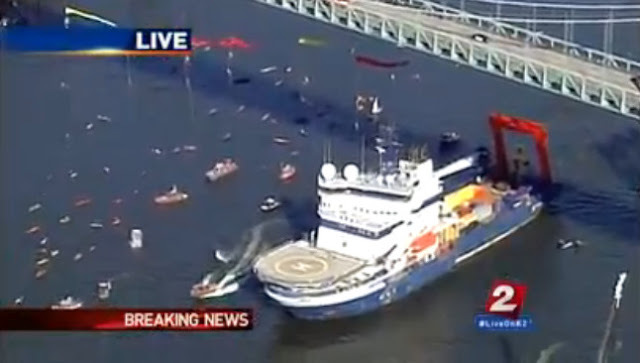 This protest follows earlier protests in May 2015 in Seattle blockading Shell's drilling rig leaving for the Arctic. See my articles: Shell Arctic oil drilling rigs unwelcome in Seattle and Shell Polar Pioneer Arctic drilling rig blockaded at Port Terminal 5 in Seattle. In January 2013 I reported on the Grounding of Shell drilling platform highlights dangers of Arctic Oil Drilling.